MK1 arms do not have a dowel pin as shown in the photo: this is the definitive difference. Note: some Mk2 arms have a short aluminium sleeve covering the dowel pin. The arm tube is 12.5mm Diameter on MK1 Silvers and 10mm diameter on MK2 Silvers. MK3 arm tubes can be lifted by nearly 1mm in the bearing house as there is no conventional gimbal bearing on the horizontal axle. 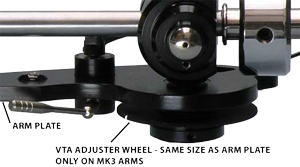 Another distinguishing feature is the integral VTA adjuster wheel shown above. May 2007 – Mk3 arms were introduced. MK3C The C represents a special Carbon tube introduced throughout 2009 starting with the Enterprise. The carbon tubes can be identified by the distinctive headshell joint with the tube. 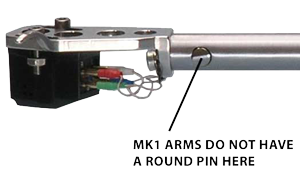 Linear Flow 2 External Tonearm Cable – a balanced and fully shielded cable was also introduced for all arms as an option but fitted as standard to all Conqueror MK3C and Enterprise MK3C arms. It is easily identified as it has a black braid covering as opposed to the smooth insulation on the other external cables.